Are you currently dealing with a slow PC? There are many ways you can speed up your PC, quickly and easily without having to call for support or go around deleting programs and files you don’t use very often. Below we’ve run through 4 Easy methods to help speed up your computer and which should be any user’s first step before deleting apps or calling for help. 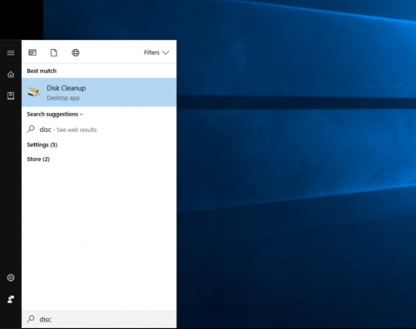 Windows has an inbuilt Disk Cleanup feature which assists the user in identifying and removing any unnecessary or temporary files as well as compressing older files among other tasks. Scroll down to the ‘Start Menu’ and type in ‘Disk Cleanup’. ‘Recycle Bin’ (if you’re sure there’s nothing in the Recycle Bin you’ll need at a later date). That is the end of the first operation. What you’ve just done is delete the temporary files your PC collects through normal usage. This includes browsing the web as well as some log files and dump files generated by the operating system and programs running on it. That was much easier than deleting the files individually and should add a little more speed to your PC. This inbuilt operation is the consolidation of all the various “Disk Fragments” into a contiguous file. Data De-fragmentation occurs on mechanical hard disks as your PC is used. This is just a fact of how mechanical hard drives work, by fitting chunks of unrelated data between other bits of data to make the most efficient use of the available space on the hard disk. NOTE: It is important that Defragmentation is not performed on Solid State Drives as this shortens the lifespan of the Disk. If that seems at all confusing than maybe skip this section and head to the 3rd way to speed up your PC. In the program which opens click on the drives you would like to defragment as shown below and click ‘Analyze’ to see whether the files require defragmentation. Optimizing each drive should can take some time, but it shouldn’t interrupt your PC’s performance. Once you’ve finished each optimization simply close the program. The power settings are something that is often forgotten and can have a dramatic impact on performance. Optimizing the power settings can allow components in your machine to enter ‘Power Saving’ mode. Here you can switch your PC to ‘Balanced’ power setting (if it isn’t already), will save your PC’s energy (as well as having a positive effect on PC speed). Note: It is best not to change the additional power settings or disabling sleep as this can have a long term adverse effect on your PC. This will only take a second to finalize. When finished simply close the program. Windows 10 comes with an automatically installed AV program called ‘Windows Defender’. You can use this program to periodically scan your machine for viruses, bugs and other temporarily files your PC picks up through browsing. Although we wouldn’t recommend using this program as your sole defense mechanism, it can be very useful in temporarily and quickly helping to speed up your machine. NOTE: It is important not to run a scan while you’re working on your PC as this can greatly slow down your machine. It is far better to schedule a scan for a friday evening or a time when you will not be using it to work. If you are at a time when you don’t need to use your machine then feel free to click on the left-hand shield icon and you’ll see you have the option for either a ‘Quick Scan’ or an ‘Advanced scan’. This can take a bit of time but after it’s finished your machine should run a little smoother and faster. If you are currently using your machine scroll to the bottom of the window and click ‘Windows Defender Antivirus options’. You’ll see an option to turn on ‘Periodic Scanning’. Click this on if it ins’t already to allow ongoing scanning which should gradually improve your machine’s performance. This option will allow you PC to scan itself periodically when you’re not heavily using it. If you do notice your PC is significantly slower during the scan you can always turn off periodic scanning and schedule an active scan when you finish your work but before you turn off your machine. There you have it, 4 ways to help speed up your computer quickly and easily. We hope you have learned something of value and are equipped to speed up your PC.